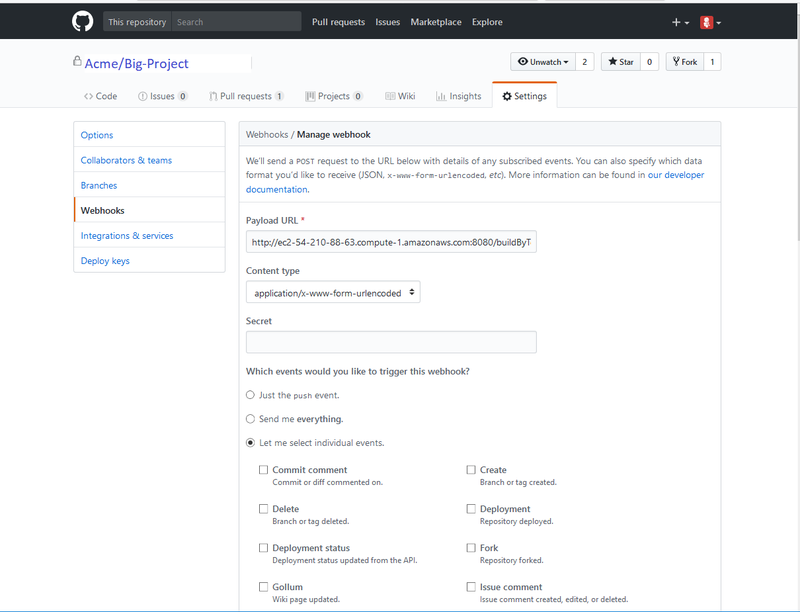 The Lingoport Suite offers two options for Pull Requests from your repository. The Pull Request can be done on your Lingoport Server or there is a distributed option that uses the Master/Agent capability of Jenkins to distribute the work among several nodes. To use the Distributed Pull Request option, please install the Node Installer optional software. Files can be committed in a Git branch or directly in the Master branch. When committing files in a branch, pull requests let you know what changes you've made to a repository before they are committed to the repository's master branch. Once a pull request is sent, interested parties can review the set of changes, discuss potential modifications, and even push follow-up commits if necessary. The Pull Requests rely on the Dashboard GitHub plugin. If your system was installed using the Stack Installer, this plugin should have been included. Verify that it is installed. Go to the Lingoport Dashboard and log in as Administrator. Select the Administration tab at the top of the window. With Installed selected, search for GitHub. You should find a plugin with the description: "Provide some integration between GitHub and SonarQube"
If you do not find the plugin installed, select Available, search for 'GitHub' again and Install it. If you are using the Distributed Pull Requests option, the first thing that needs to be done is to set up nodes in Jenkins. If you installed the Node Installer and followed its setup instructions, there should be a master system (where Jenkins and Lingoport Dashboard are hosted) and at least one agent or node system. The master system should be able to ssh into the agents' centos user and the jenkins user. If this is not completed, make sure that is done before proceeding further. If you are not using nodes and agents, skip to the PullRequests section. [01/26/18 16:26:19] [SSH] Opening SSH connection to ec2-54-227-210-213.compute-1.amazonaws.com:22. [01/26/18 16:26:19] [SSH] SSH host key matches key in Known Hosts file. Connection will be allowed. [01/26/18 16:26:19] [SSH] Authentication successful. 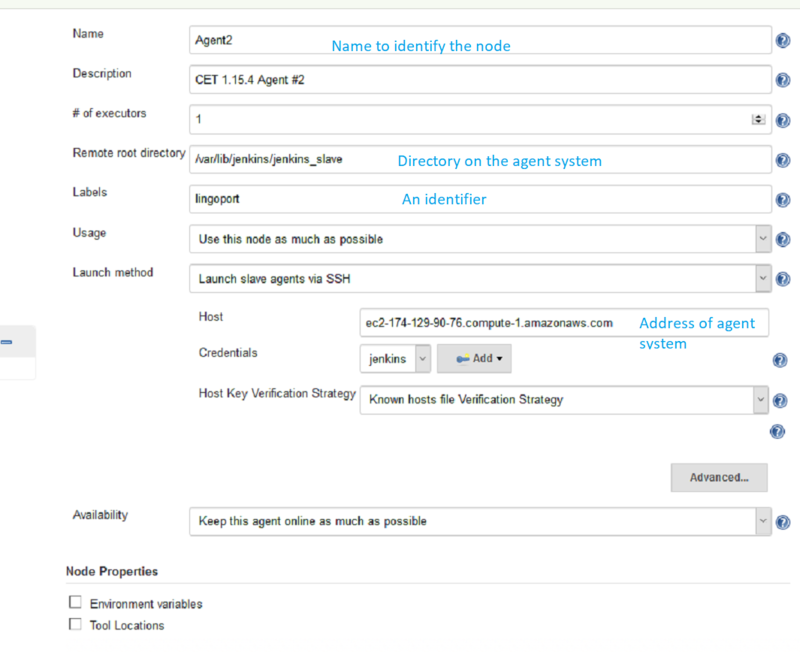 To verify that the Agent setup is correct, use the Jenkins 'Debug' job. Under General check Restrict where this project can be run and set it to lingoport. Note that it shows that it ran on the Agent using the lingoport label. There are two Jenkins job templates for Distributed Pull Requests. The Distributed Pull Request makes use of the Jenkins master/agent system. 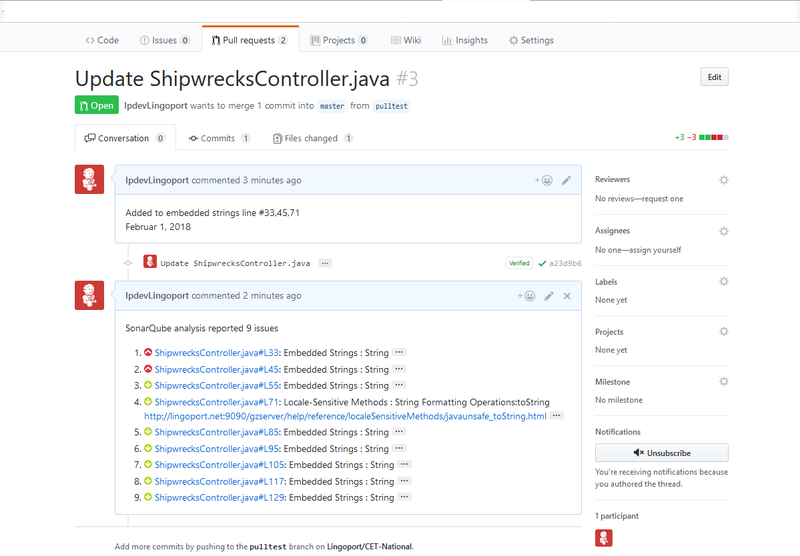 Create a new Jenkins job using the Lingoport.SampleLite-PullRequest or Lingoport.SampleLite-DistributedPullRequest template. This should be modeled on an existing Jenkins project. For example, if you have a Jenkins project called Acme.BigProject and you want to use PullRequests with this project and repository, name the new project Acme.BigProject-PullRequest. Once you have created the new PullRequest project, some configurations need to be modified. Make sure the name is <Group>.<Project>-PullRequest. The <Group>.<Project> Jenkins job should already exist and have been executed. Anything other than <Group>.<Project>-PullRequest may cause problems. Leave the payload parameter alone. Do not modify it. If nodes have been set up for other projects, select Restrict where this project can be run and set it to master. If nodes have NOT been set up, nothing needs to be done with this option. Under Build Triggers, select Trigger builds remotely (e.g., from scripts) and set the value to HOOK. Save the configuration and Enable the project. Once you have created the new DistributedPullRequest project, some configurations need to be modified. The DistributedPullRequest should be based on a <Group>.<Project> Jenkins job that has been executed. Select Restrict where this project can be run and set it to lingoport. Some configuration needs to be done on GitHub for the PullRequests to occur. Select Settings at the top of the window. Select the Webhooks tab in the left menu. Select the Add webhook button. Which events would you like to trigger this webhook? Select: Let me select individual events and check the Pull Request item. If everything is correct, then after adding the Webhook, the Jenkins job <Group>.<Project>-PullRequest or <Group>.<Project>-DistributedPullRequest should be triggered. The job may FAIL, but at this point the verifying the communication between GitHub and the Jenkins job is a success. 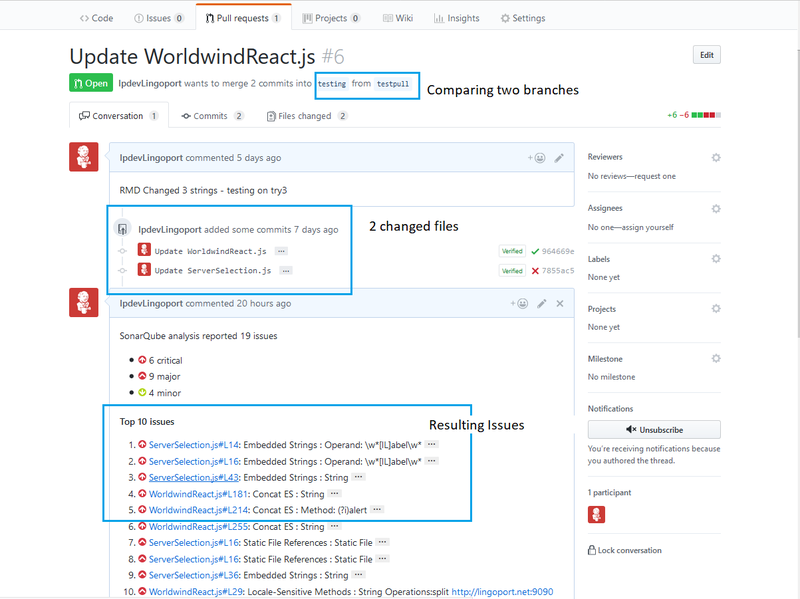 Use or create a new branch in the Git Project with changes to internationalization issues. Select the two branches you wish to compare. You should see the differences on the screen between the two branches. Select the Create New Pull Request button and enter a comment. This page was last edited on 11 July 2018, at 13:26.